The North Shore Land Alliance is extremely pleased to announce the acquisition and dedication of the 32-acre Wawapek Preserve, formerly the DeForest Williams property, in Cold Spring Harbor. In partnership with the Town of Huntington, Suffolk County, New York State, The Conservation Fund, The Nature Conservancy and 358 private donors we were able to acquire and permanently protect this environmentally significant property on March 10, 2015. This complex project took over three years and a combined $8.5M to complete. Acquisition of this historic property is a momentous achievement, one we couldn’t have done without our partners and the support of the community. 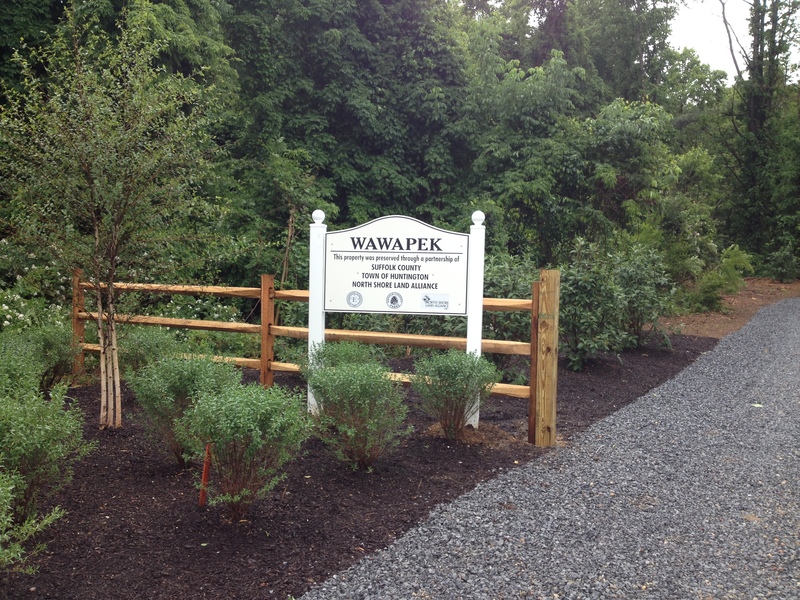 Upon closing, the Land Alliance began working on the improvements necessary to open Wawapek to the public. This passive use preserve provides residents with walkable woodland trails, a restored garden area featuring a circular yew hedge and beautiful specimen trees. Stewardship work commenced after we finalized our landscape and management plans with the Town of Huntington and Suffolk County. By early May, we began working with Victoria Silverman at Main Street Nursery in Huntington to create an entrance drive and parking area for visitors. We also installed fencing, signage, native plantings, trails, benches and an orchard. Thanks to our staff and Main Street Nursery, the construction, installation and restoration of Wawapek took only three months to complete! In the first weekend of June, we celebrated the official opening of the Preserve with a donor party on June 5th and a community gathering and ice cream social on June 6th. Both were well attended, with over 100 people attending each event. Representatives from the Town of Huntington, Suffolk County and New York State were able to join our community celebration on June 6th, including Town Supervisor Frank Petrone, County Legislator William Spencer and New York State Assemblyman Chad Lupinacci. Together, we celebrated the collaborative efforts of protecting Wawapek and discussed the importance of protecting our remaining natural lands for the benefit and enjoyment of future generations. Wawapek is significant both historically and environmentally. This historic property was once part of a 600+-acre parcel that in 1898 encompassed what the Williams family called Wawapek Farm. The original land purchase from the Matinecock Indians was made in 1653 by early settlers of Wigwam Swamp. More than 60% of the property is comprised of mature hardwood forest which provides the area with erosion control, protects air quality and provides habitat to a variety of wildlife, trees and wildflowers. Eastern Box Turtles, a New York State watch list species, have been found on the property and at least three state-protected plants have been documented. The property also lies at the edge of the Oyster Bay Important Bird Area, one of New York State’s 136 sites designated by Bird Life International and National Audubon. We urge you to come see Wawapek for yourself. We would also ask you to consider donating to the Wawapek Stewardship Fund which will provide ongoing stewardship and restoration work for the Preserve. We still have naming opportunities available and several ongoing restoration projects including maintaining/restoring the existing yew round and Wisteria trellis, planting native wildflower gardens and adding to our existing entrance plantings. If you are interested in supporting our stewardship efforts, including becoming a volunteer, please call us at 516.626.0908.